Field of Amaranthus cruentus between Ell and Lannen, 20th September 2017. Photo by Claire Wolff, SICONA. 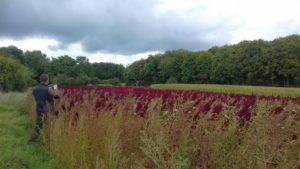 Amaranthus cruentus L. was first observed in the wild 1 in Luxembourg, on 28th August 2018, on the border of maize fields and a pasture between Ell and Lannen in the Canton of Redange (Midwestern area of Luxembourg). An on-site inspection on 29th August 2018 revealed that the population extends over 300 m at the edge of the fields and at the roadside between the coordinates LUREF 56775 E | 93241 N and 56758 E | 93542 N. Several specimens were deposited in the herbarium of the National Museum of Natural History. This population is probably a consequence of the cultivation of this species on an adjacent field in 2017, as the photo on the right illustrates. Photos by Christian Ries, MNHNL, 29th August 2018. Last updated on Friday, August 31, 2018.